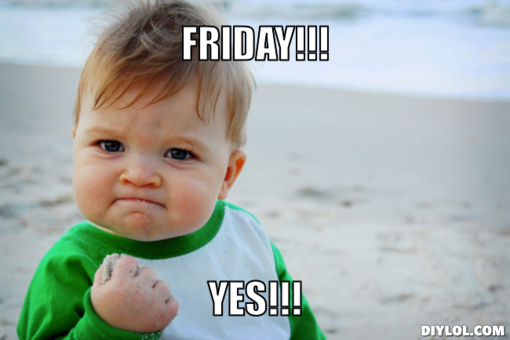 Hope you all have had a great Friday! My time at work was overly productive for a Friday. I think I can thank the long weekend ahead for putting me in a good mood! HA this baby always gets me. He’s the best inspiration. Anyways, this evening has been a productive one as I finish up all of my Bridal shower crafts for Sunday afternoon! One of my longtime best friends, Katie, is getting married Sept. 28. I’m a bridesmaid! And as such, I have a few fun obligations to fulfill. 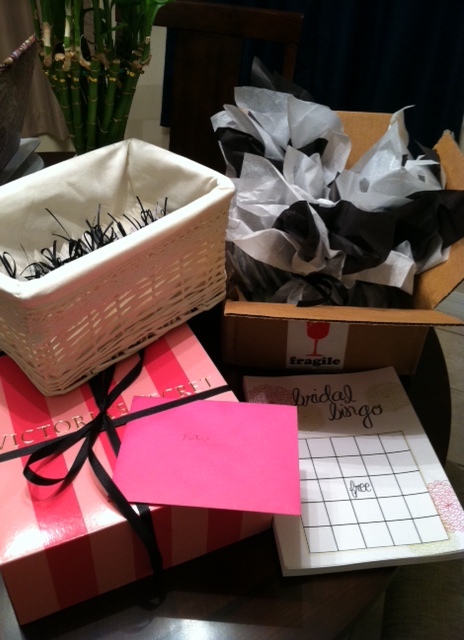 One of them is being in charge of the bridal shower favors and games for the shower on Sunday afternoon. Fun times! And thank goodness for Pinterest, because this girl is far from crafty. 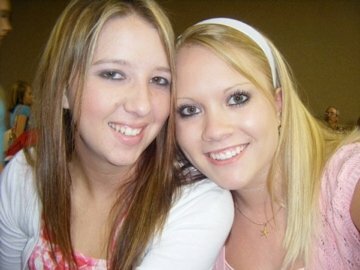 These were both taken in 2008, the year we graduated high school together. We were such babies! Oh how the times have changed. Thankfully she is a great friend that I know will always be a part of my life. Her shower is going to be a Bridal Tea Party, so the favors were easy-peasy to put together! And super cheap. Win-win! 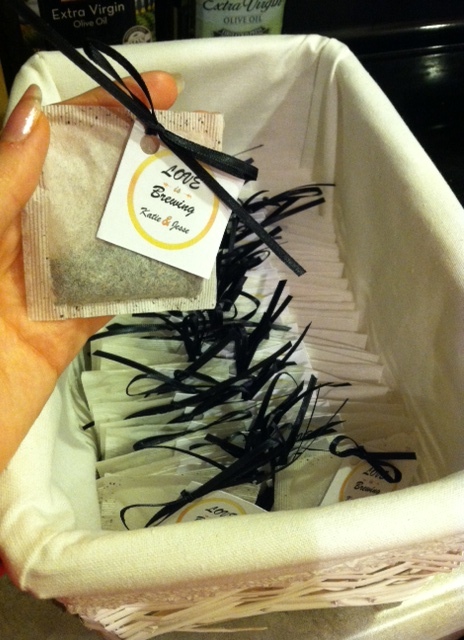 Tea bags + homemade tags + ribbon = Pretty darn cutesy! 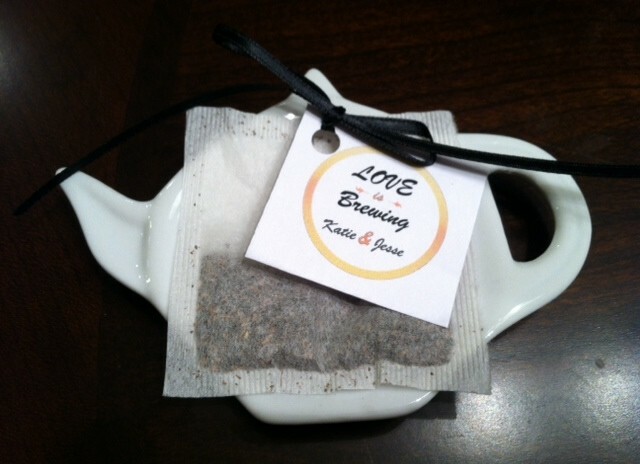 I found these porcelain tea bag caddies to give to the bridesmaids and to Katie and her family members. 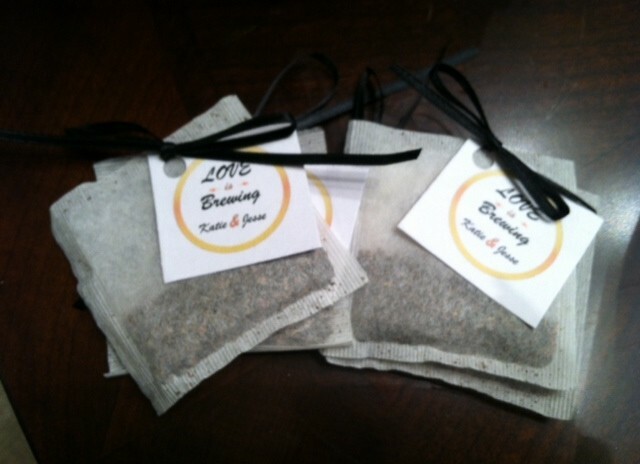 Each with their own tea bag favor attached! They’re perfect for a tea party so you have someplace to rest your used tea bag. Genius! 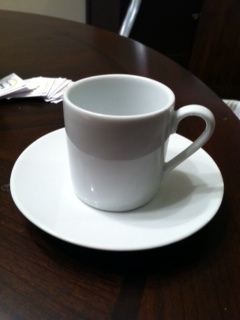 I also found these adorable mini tea sets to give away to the game winners at beau-coup.com. And now I’m completely pooped! But at least prepared for tomorrow! On that note, let’s backup to lunchtime. 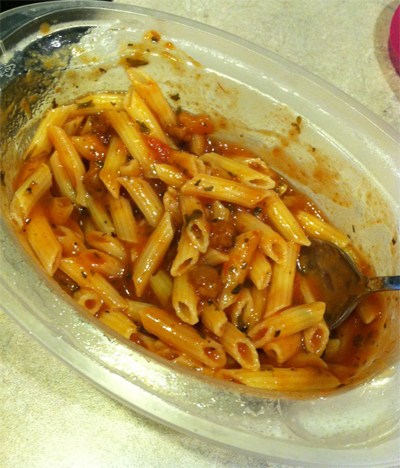 Lunch today was brought to you by….Cafe Fresh Pasta Steamers! I’m not sure why, but this was the first thing to pop out at me when I opened my pantry at noon. So I got it cooking in the microwave and had a handful or two of Chip’ins White Cheddar popcorn chips. 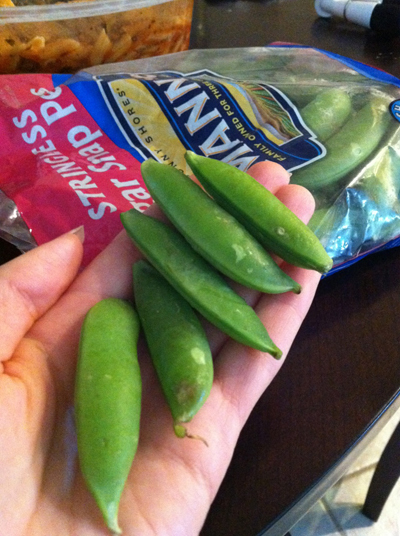 It was actually super yummy, just not too filling so I had some snap peas on the side. I may have also had a couple spoonfuls of cottage cheese and a Fiber One 90-cal bar because I was so stinkin’ hungry! Oh well, some days are just ‘hungry days’ I guess! Nick and I decided to go to Qdoba for dinner. I love going here for a quick bite out where I can also eat healthy. 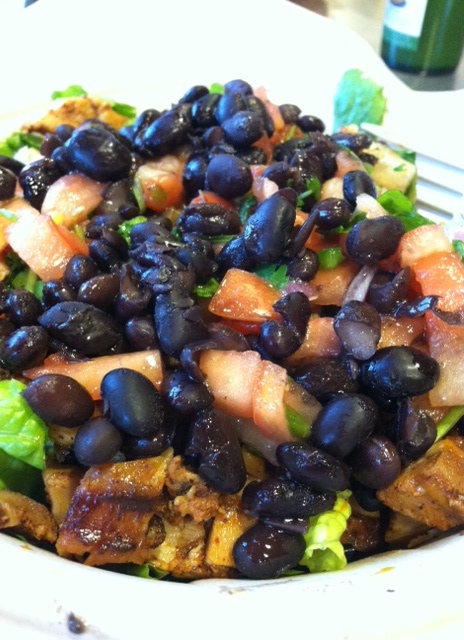 I always get the Naked Grilled Chicken Taco Salad with corn salsa and I love it! 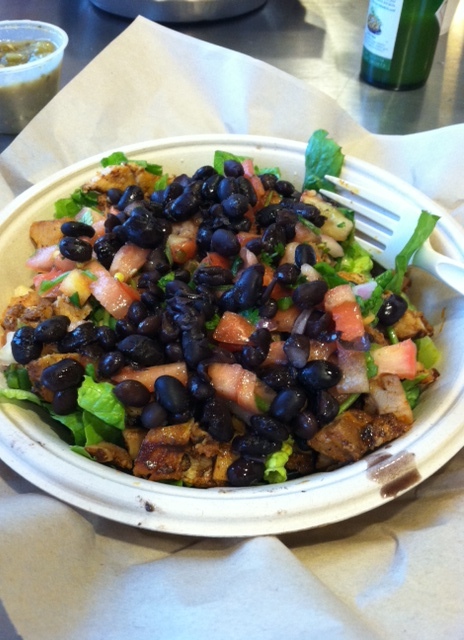 I also feel extra healthy because I have to order it without the extra sour cream and cheese. Darn lactose-intolerance makin’ me be healthy! haha At least this time my tummy wins. I never give into sour cream. It just hurts too much! I polished off my entire salad while Nick enjoyed his steak burrito with some chips and verde salsa. It was a nice little end to a busy week! Have a great evening! I’ll see ya sometime tomorrow after I’ve been pampered at the spa with the bride-to-be!